Health and Safety in the DIY home engineers work place, and the safe use of substances hazardous to health. For Industrial users we are able to supply SDS safety data sheets for all of our products via email or a downloadable PDF and Word document. SDS sheets are being updated regularly along with regulations so please feel free to email for a copy of the latest SDS to aid your work place assesment. We are not able to offer risk assesments for our home engineer customers on how to use our products safely as each persons work environment will be different. We urge all of our DIY customers to read the health and safety data on the back of every tin or bottle. If in any doubt take the maximum precautions to protect yourself. It is safer to assume the worst than to take no precautions at all. The use of personal protection equipment and making sure you understand the risks involved is the users responsibility. All of Rustbusters products are compliant with the new regulations on VOC's. This does not mean that all of the usual health and safety precaution should not be taken. 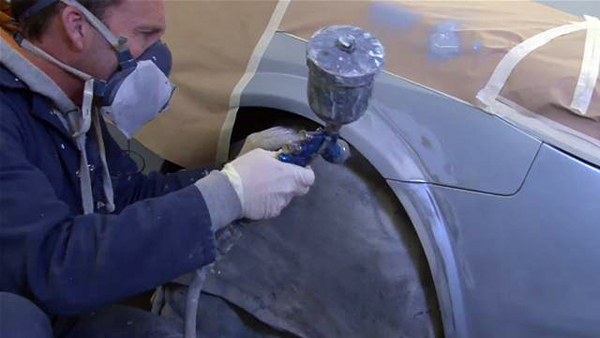 We recommend that a risk assessment is carried out by all home vehicle restorers prior to using industrial quality paints and coatings. A full safety data sheet is available for each product in the information/data sheet section of our web site. The following precautions should always be taken when using paints and chemicals classed as harmful or irritant. Every Rustbuster product is clearly identified in this regard. Read all of the instruction thoroughly before opening the tin. Down load the data sheets from our website, Or down load our App and read on your phone. Only work in well ventilated work areas. Open a window or door before commencing work with paint or chemicals. Safety glasses should be worn in the work area. Safety glasses should be worn before opening tins and bottles of paint or chemicals to avoid splashing your eyes. Barrier cream should be applied before handling paint or chemicals. Wear only Suitable gloves for the work in hand. Wear suitable gloves before opening tins or bottles of paint or chemicals. Wear a Plastic apron if using hazardous chemicals. Wear apron before opening tins of paint or chemicals. Wear a Suitable A2/P2 air respirator mask. If you feel drowsy leave the area and improve the ventilation. Wear a paper filer mask when cleaning with power tools or creating dust clouds. Wear non slip safety footwear with toe protection. Wear Clean or disposable overalls. Before opening tins of paint or chemicals. Work overalls should be clean or disposable. Keep the work area clean and tidy. Replace container lids as soon as you have dispensed paint or chemicals from them. Remove empty tins and waste from the work area every day and dispose of responsibly. Dispose of used wrags and blue engineering paper every day. Do not keep oily rags in your pockets. Think Think Think of the worse case scenario before going to work with paint and chemical. All of the above safety wear is available from the safety wear section of our website or any DiY store or trade outlet. Please take care , these simple preventative measures will go along way to ensuring you health and safety in your home garage or workshop.